Saturn’s moon Titan is a frigid hellscape by Earth standards, but it’s also one of the most hopeful spots for discovering alien life in our solar system. A new scientific paper hints that conditions on Titan’s surface might be favorable for the chemistry of life to emerge. Titan is the only other world we know of whose surface is shaped by lakes, rivers, and rainfall. Except deep in Saturn’s rings, it’s not water that flows, but methane. Even so, Titan’s remarkably Earth-like appearance has led astrobiologists to wonder whether some sort of cold-adapted, non water-based life form could emerge. But before we can seriously talk about life on Titan, we need to take a step back and establish whether certain basic conditions exist. Even at temperatures of -290 degrees Fahrenheit (-179 degrees Celsius), there needs to be enough available energy for life’s building blocks to form. “In order for anything to happen on Titan, you need to be able to do chemistry at a low temperature,” Cornell chemist Martin Rahm told Gizmodo. Rahm’s latest research, published this week in the Proceedings of the National Academies of Sciences, identifies a mechanism by which energy from the faint sun might be absorbed through Titan’s cloudy atmosphere. 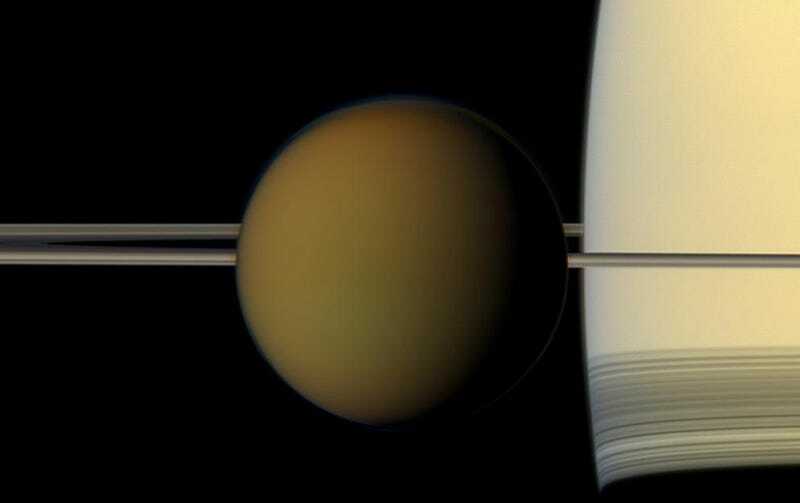 One of the key molecules the Cassini and Huygens missions have identified in Titan’s atmosphere is hydrogen cyanide (HCN), an important precursor to life on Earth. Prior studies indicated that on Titan’s surface, HCN can react to form long chains, or polymers, called polyimine. Now, Rahm’s models are showing that under Titan-like environmental conditions, polyimine is both flexible and good at absorbing sunlight. In other words, it’s time to go alien hunting on Titan.